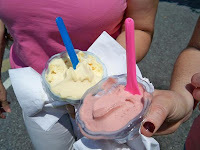 On our way back from LIC's Greenmarket this weekend, we treated ourselves to some gelato from Manducatis Rustica. Vicky and I have been there before--and loved it--but we wanted to introduce it to my mom who immediately appreciated its rustic, homemade charm. We browsed around and looked at the fun kitchen knick-knacks and then proceeded to admire the gelato. We were in the mood for something fruity so we each ordered a small serving of different flavored fruit gelato. I got the banana, Vicky went for the passion fruit and my mom opted for the apricot. They were all fresh and a perfect little treat to snack on. I liked Vicky's passion fruit the best, followed by my mom's apricot. Unfortunately, I didn't care for mine because it had too much of a banana taste, if that makes any sense. The flavor was too strong for me and it would've been nice if mixed with some nuts or even chocolate chunks. I think that next time I'll go for my beloved nocciola (hazelnut). A small cup of gelato is $2.50, setting our grand total for 3 cups at $7.50, which is quite affordable. 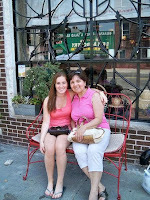 You can sit outside on Manducatis' little bench (pictured above) and enjoy it until you're done. Mmmmm that sounds really good - pairing chocolate gelato with fruit. I should've thought of that. Next time!